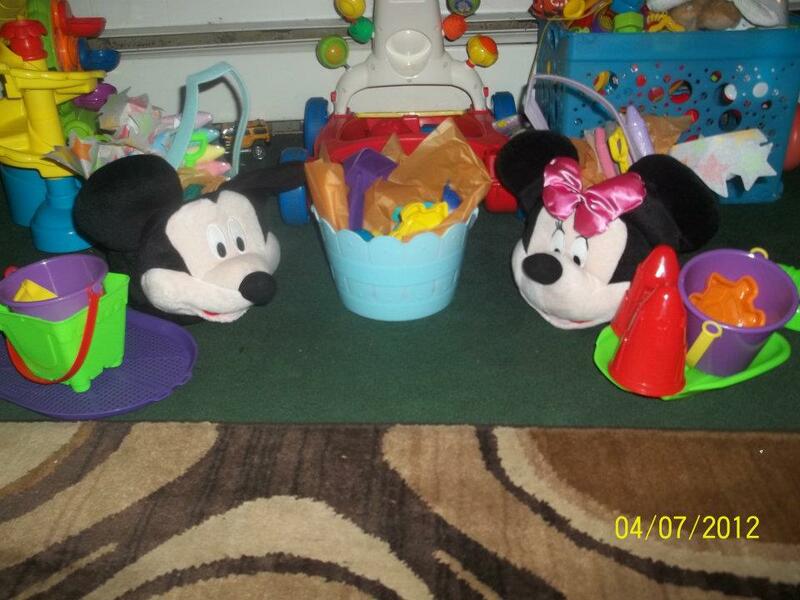 ♥ Mama 2 Multiples ♥: Happy Easter! We had an amazing Easter this year!! 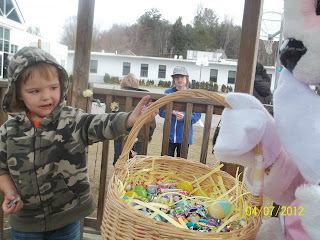 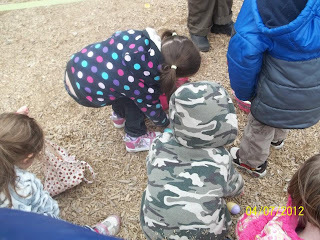 The day before Easter, we went to a local elementary school, where there was a HUGE egg hunt and other activities for children, along with the Easter bunny! 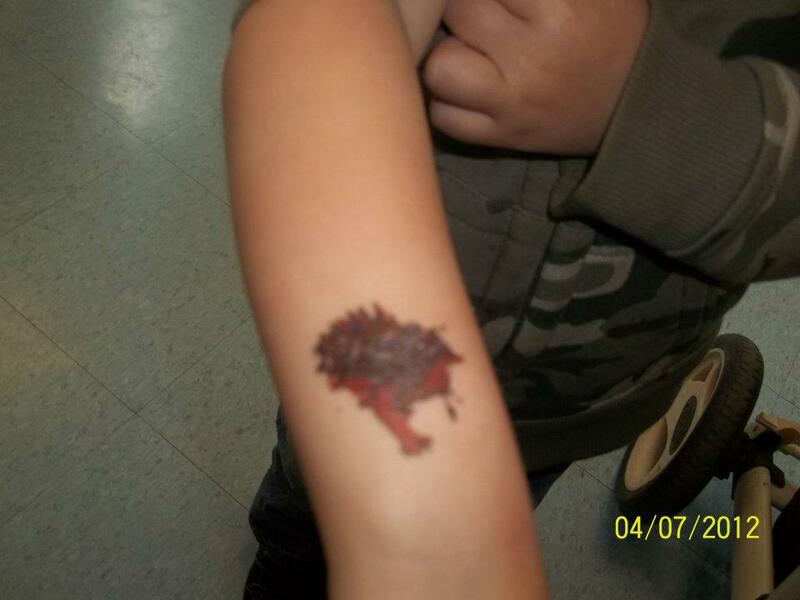 The kids had a BLAST getting fake tattoos, coloring, making different Easter crafts, and most of all, hunting and finding lots and lots of eggs that were loaded with awesome goodies! When we first got in the school, there were tables set up for the kids to hunt for candy. 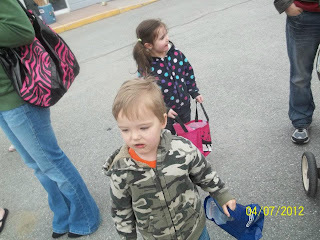 Connor and Merasia LOVED it! 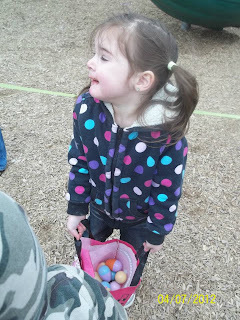 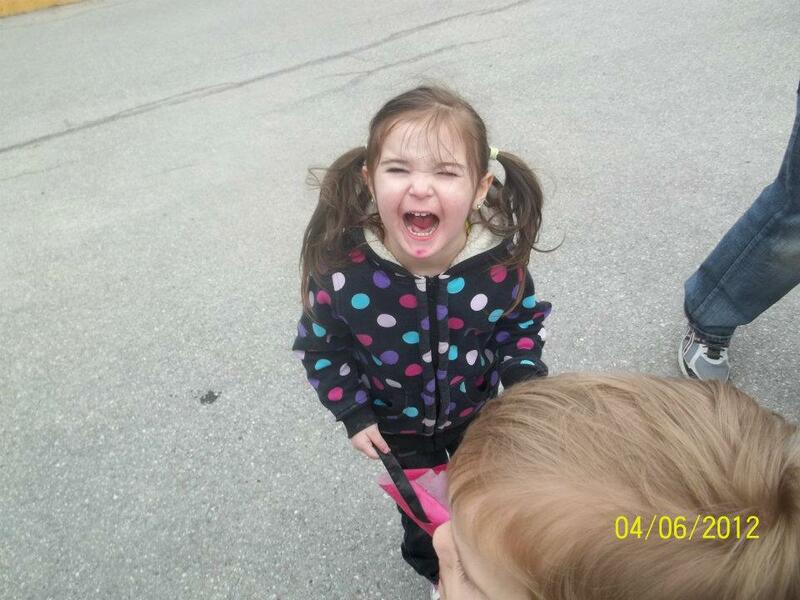 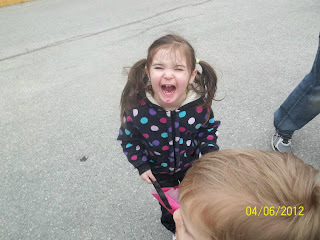 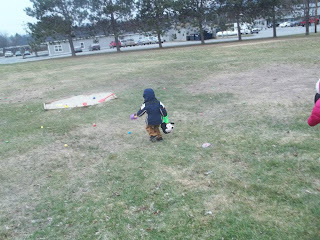 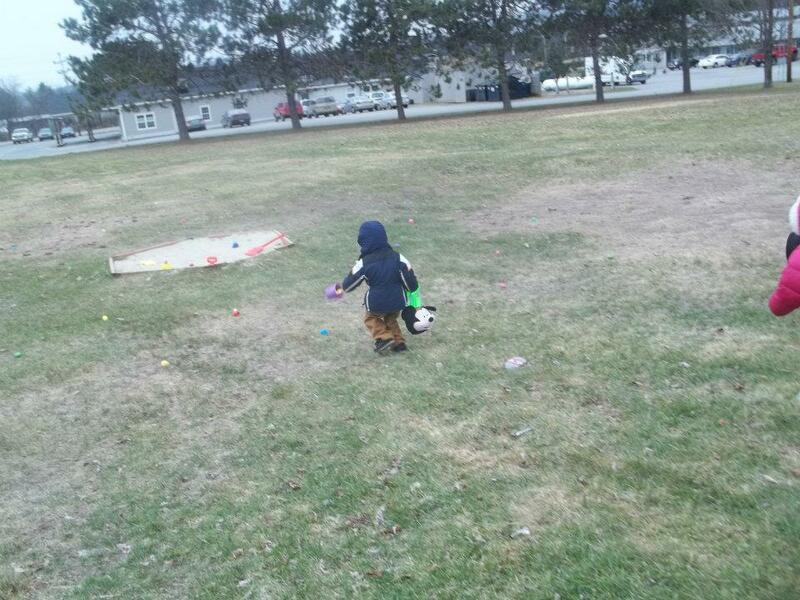 After we hunted for candy, we waited outside for the Easter bunny to arrive and the egg hunt to start. 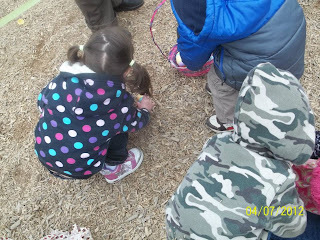 When it was go time, Connor and Merasia knew exactly what to do and wasted NO time in hunting and finding lots of eggs! 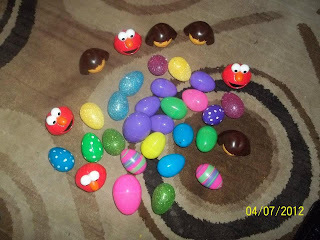 There were SO SO SO SO many eggs, so there was more then plenty for everyone, which was good, so nobody went away disappointed with only a couple eggs. 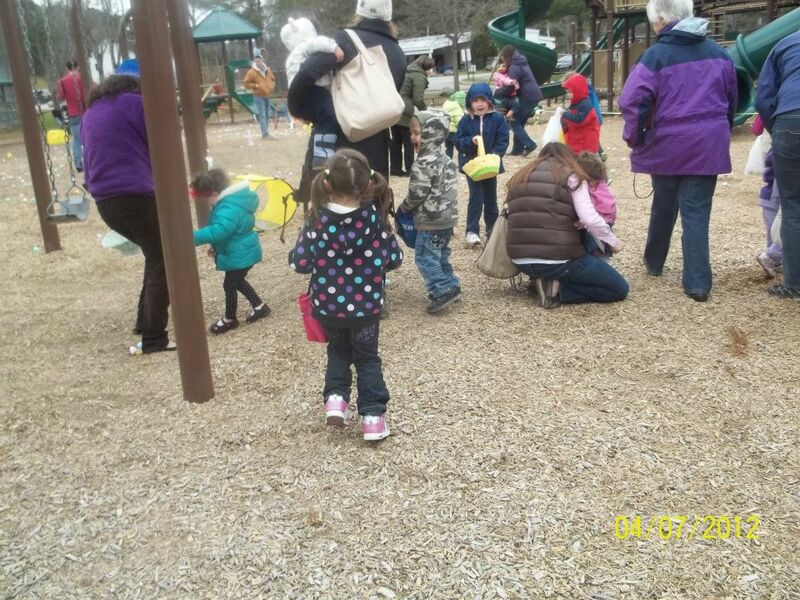 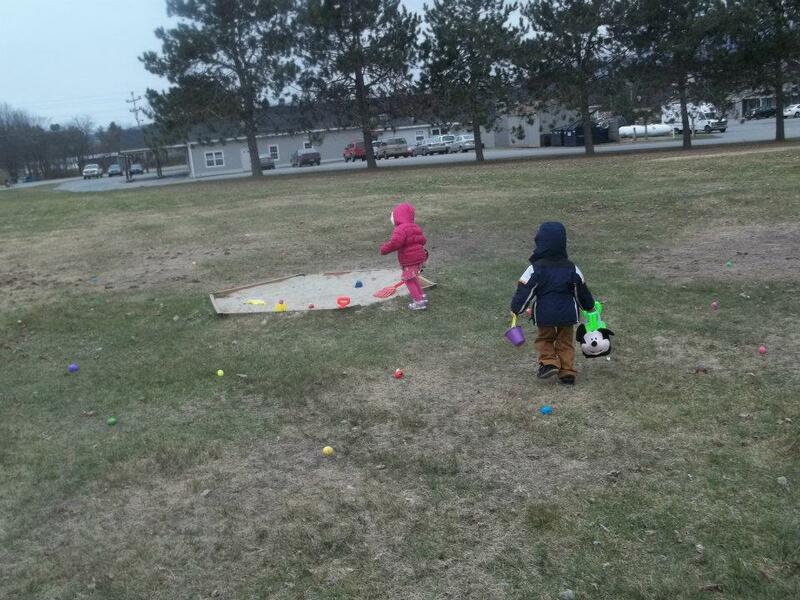 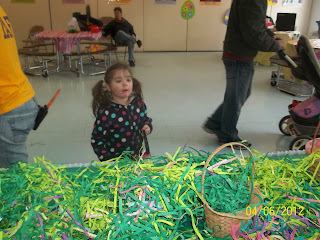 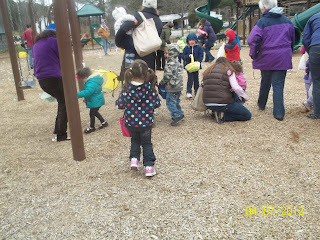 After the egg hunt, we went inside to warm up and have some fun. 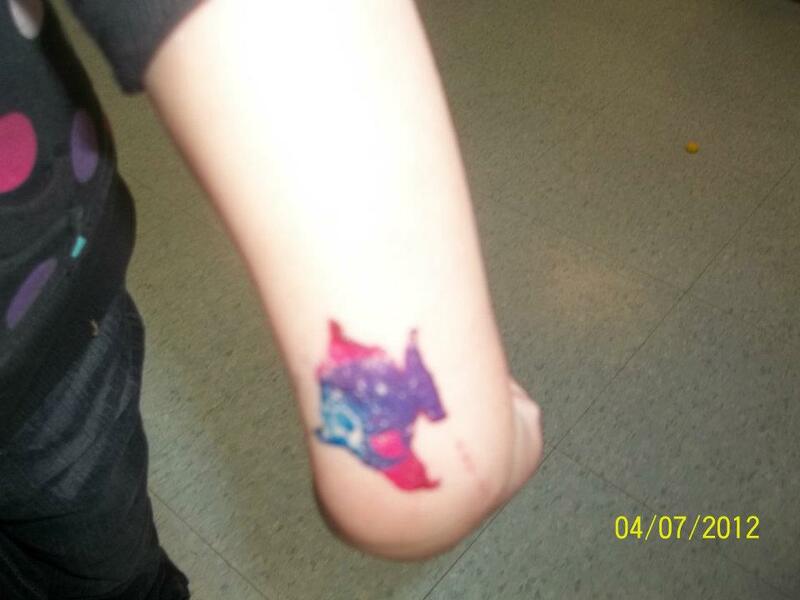 Daddy helped Connor get a dinosaur tattoo and helped Merasia get a fishy tattoo, and they did some other activities and played with their friends. 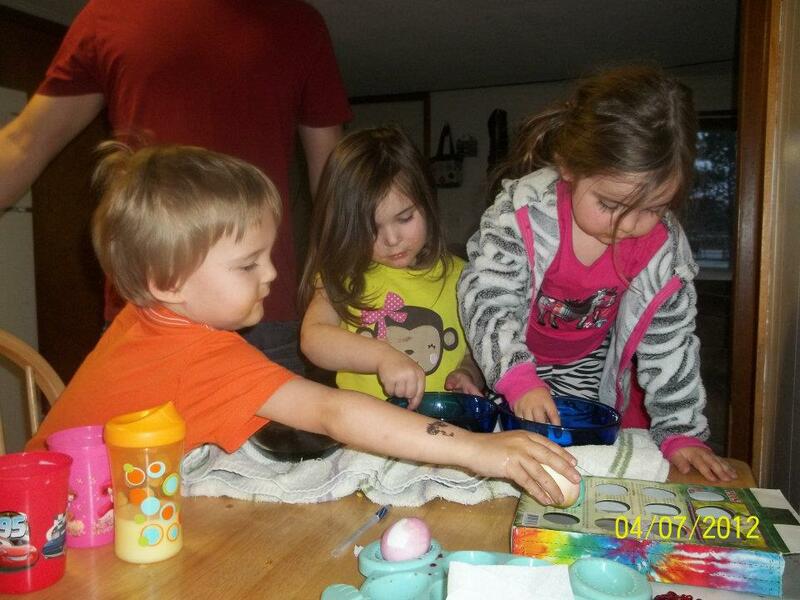 After a tiring but eventful day, we headed home and our friends came over later for dinner and some egg-dying fun. 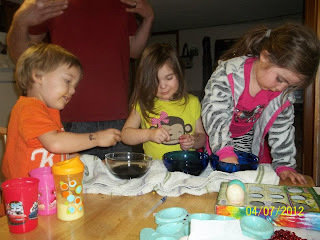 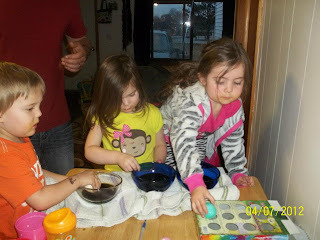 This was the twins first experience with egg dying, and they had a blast! 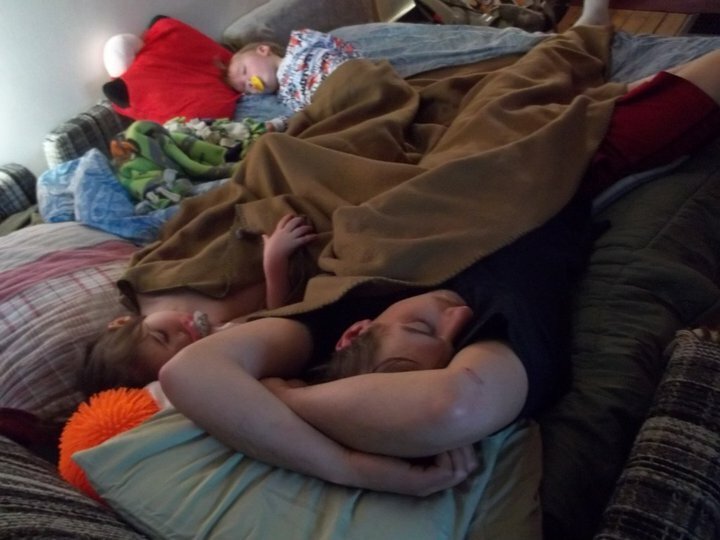 They fell into bed that night, completely exhausted from such a fun filled day. After bed, I went to the store to get a few last minute Easter gifts, and then went about filling eggs for the Easter egg hunt and putting all 3 kids' Easter baskets together. We set the baskets up in the living room for the kids to see when they woke up the next morning. It's hard to see in the pics, but we got them sidewalk chalk (they just discovered it and loooove it and with the spring/summer coming, it's perfect! 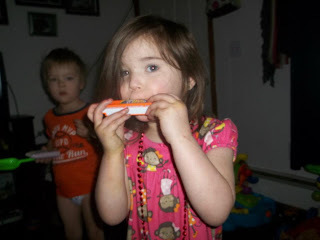 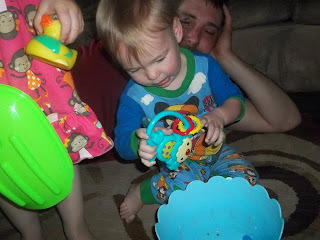 ), toy harmonicas and tambourines (they are REALLY into musical instruments lately! 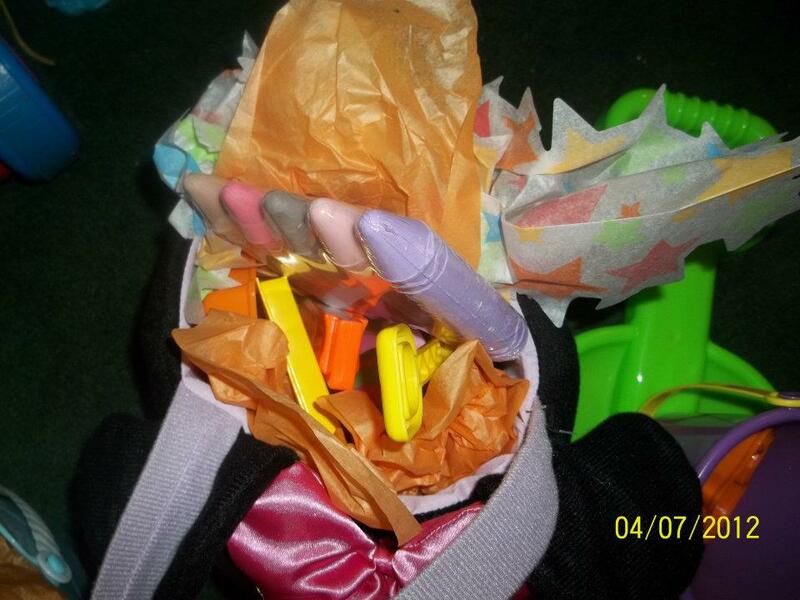 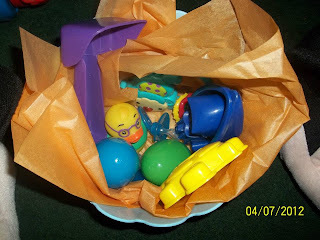 ), some candy of course, and most of all, BEACH TOYS!! 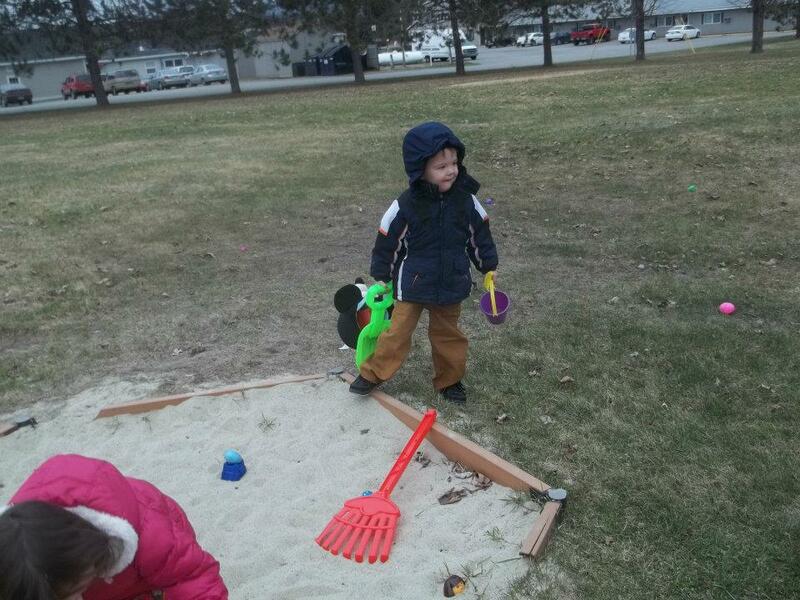 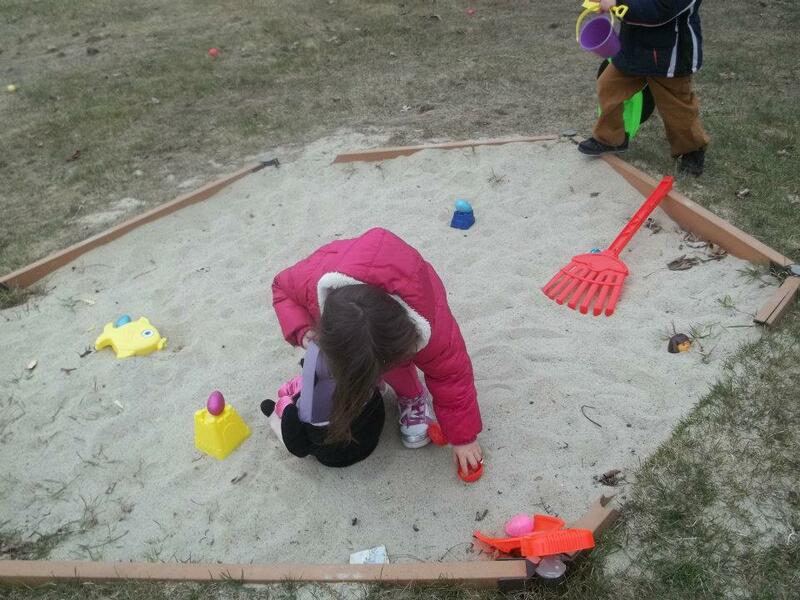 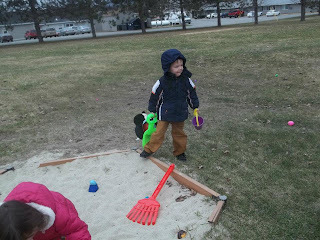 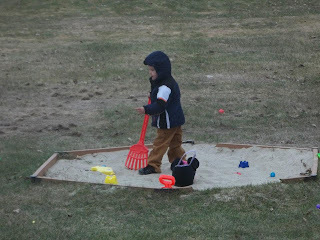 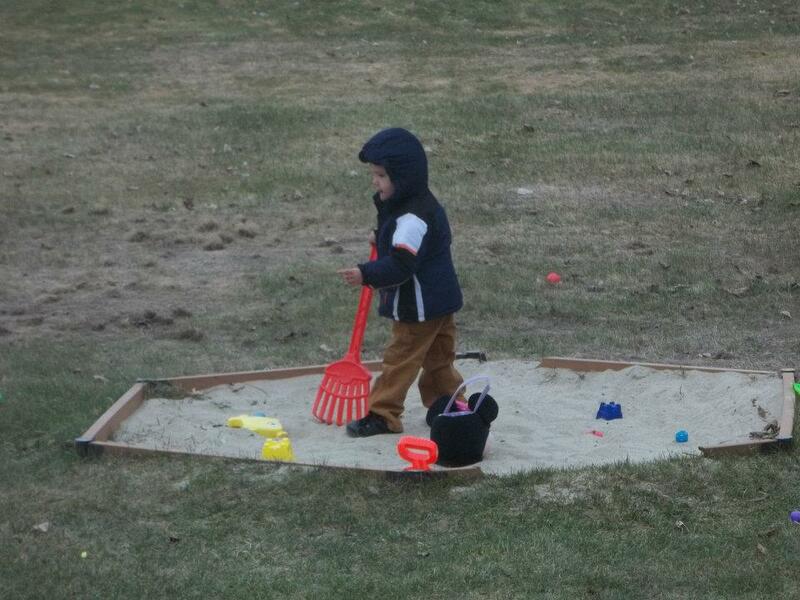 We have a sandbox where we live too, so they can use the toys here, and at the beach this summer. 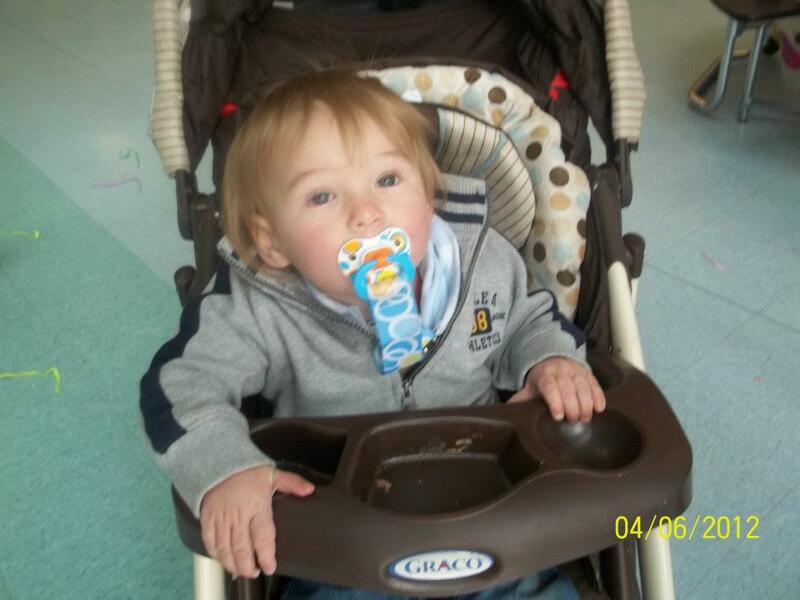 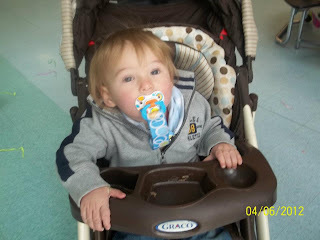 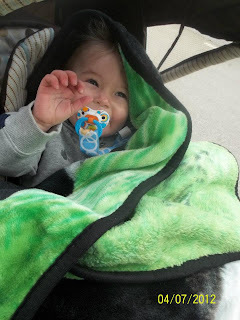 For Mason, we got him some pacifiers, a duck for the beach or bathtub, beach toys, and a monkey toy. 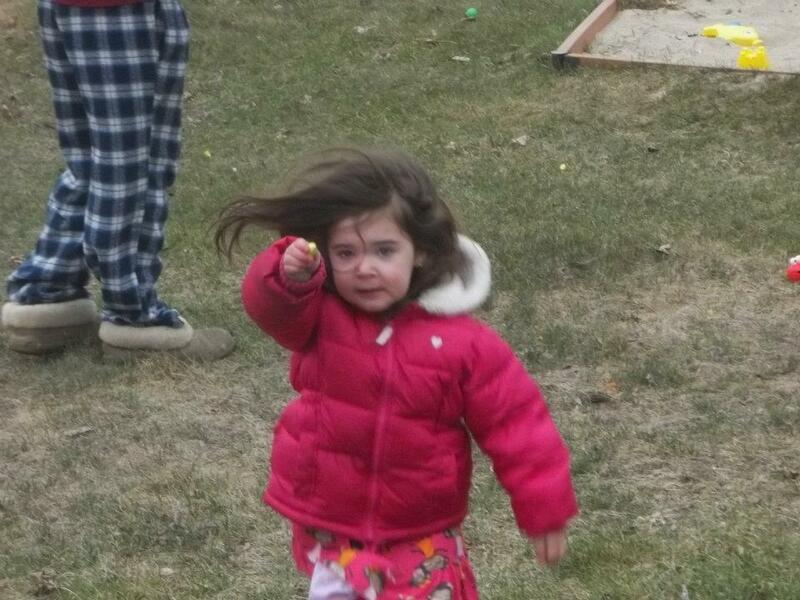 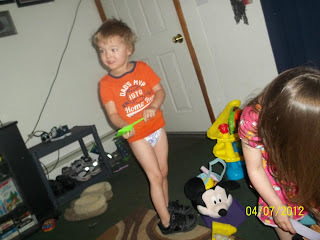 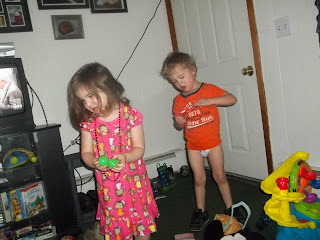 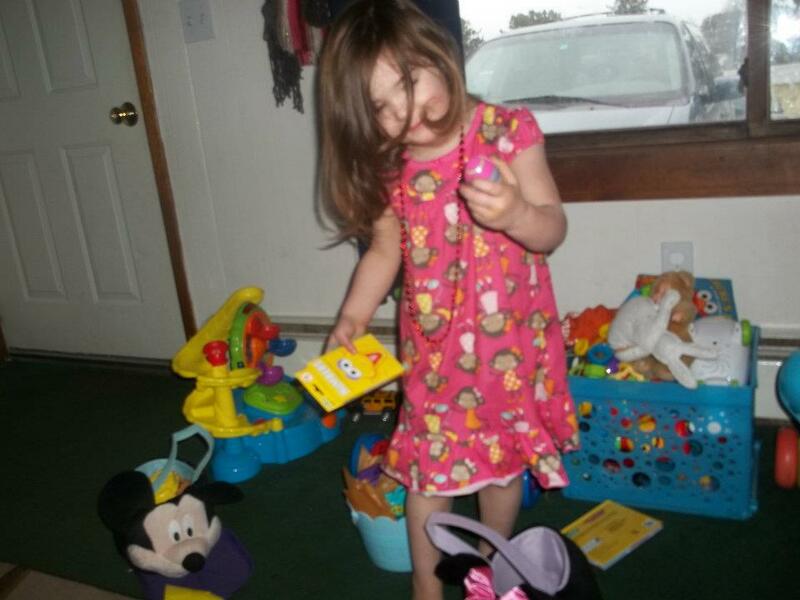 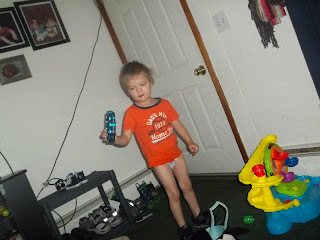 After that, we threw some pants on the kiddos, and headed outside for our own Easter egg hunt! 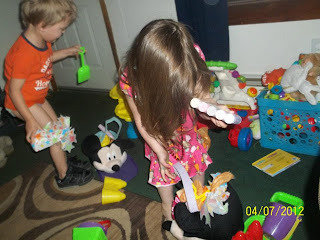 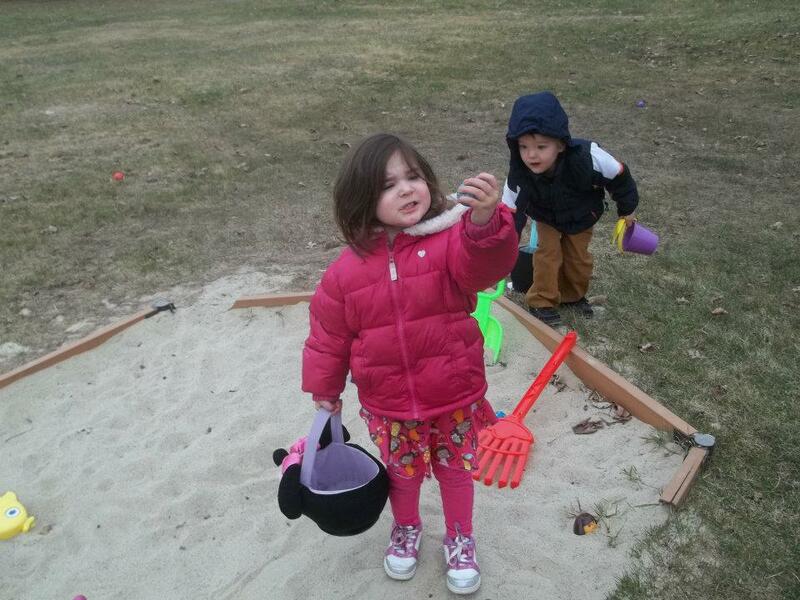 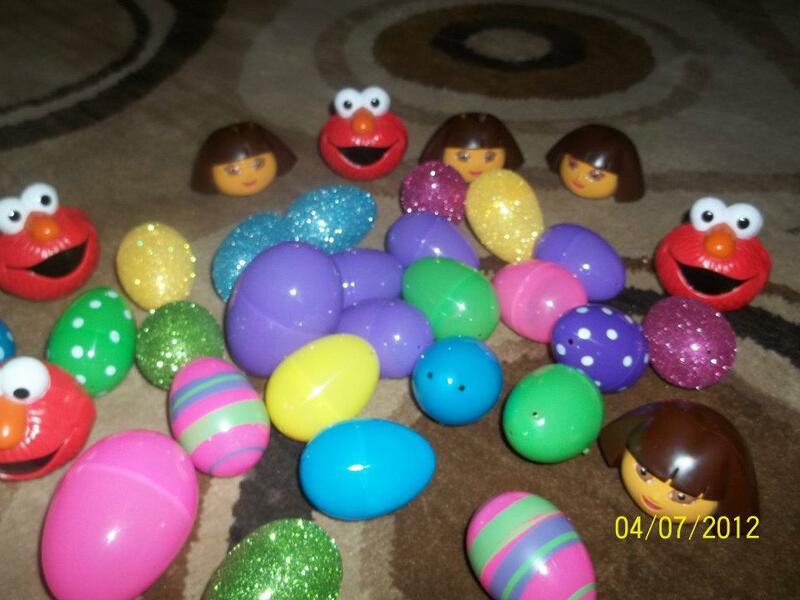 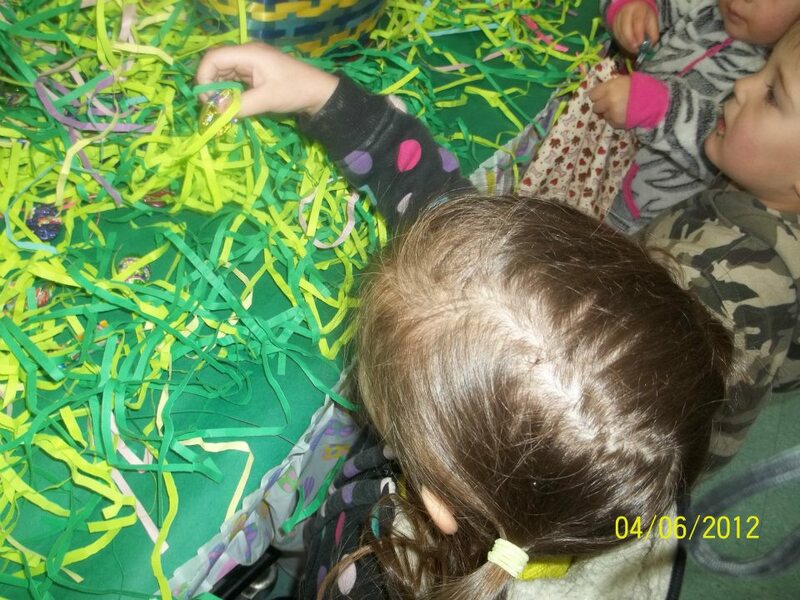 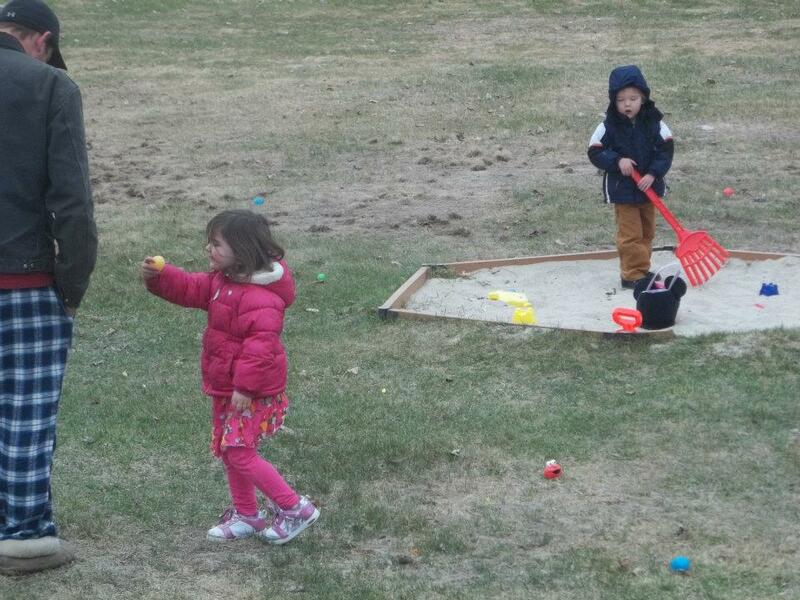 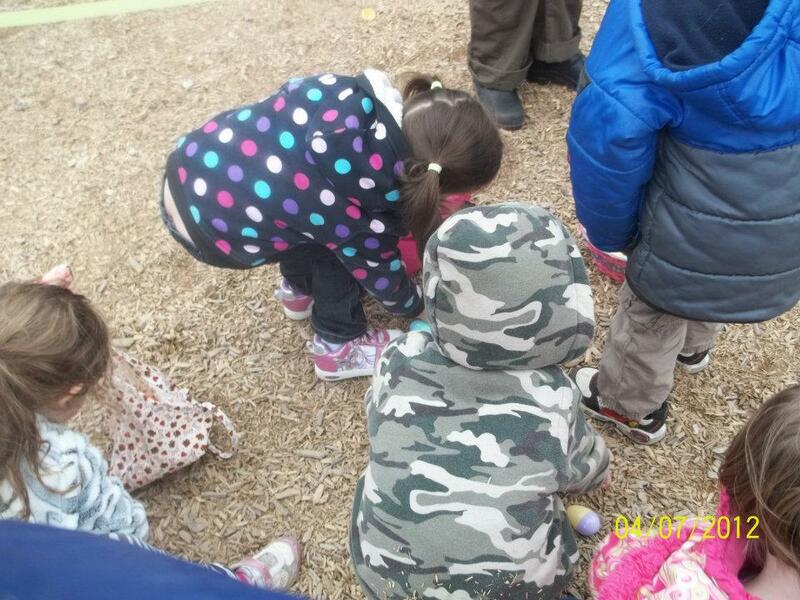 They had SO MUCH FUN looking for eggs and discovering all of the cool toys the Easter bunny left for them! 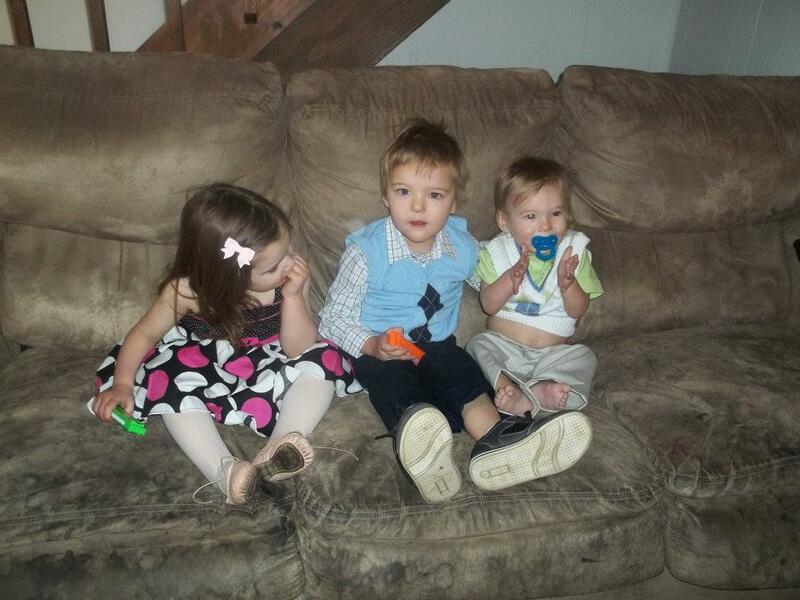 We bribed them to come inside with their new Easter clothes...but hey, it worked! 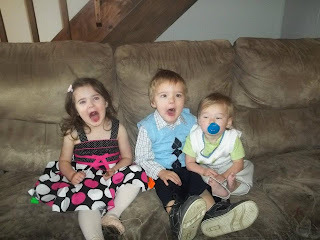 They were excited to see and wear their brand new Easter outfits! They were all so darn cute! 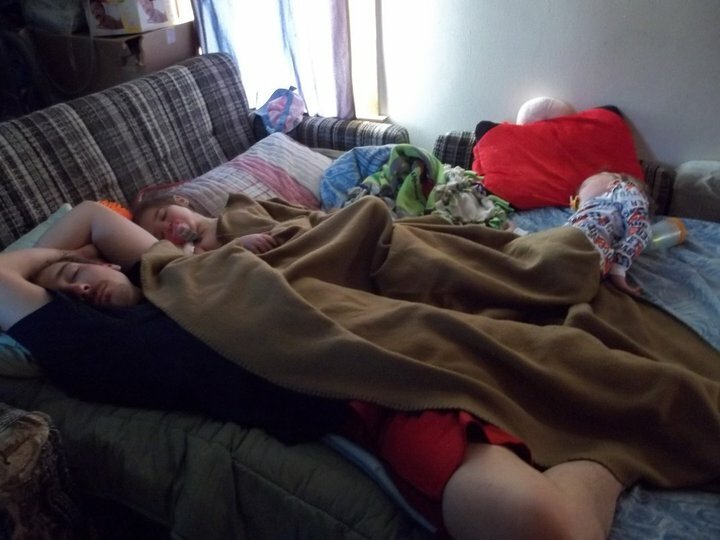 For the rest of the day, we hung out at home, mostly. 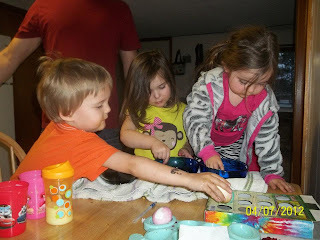 Our friends, Des and Violet, came back over to hang out for a while, and then we went to visit my sister at her new place for a little while, where Mason had a blast chasing her kitten around and getting into mischief. 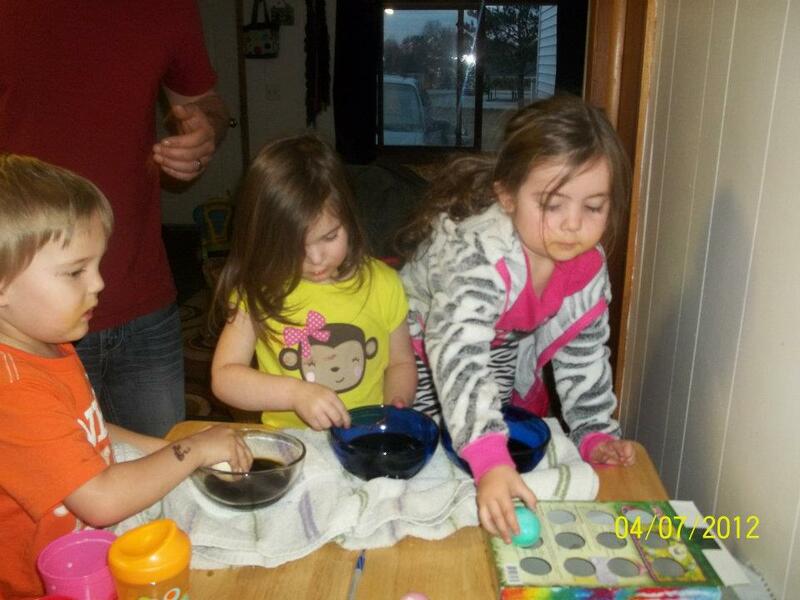 Then we came back home and had a nice Chicken dinner with Des and Violet. 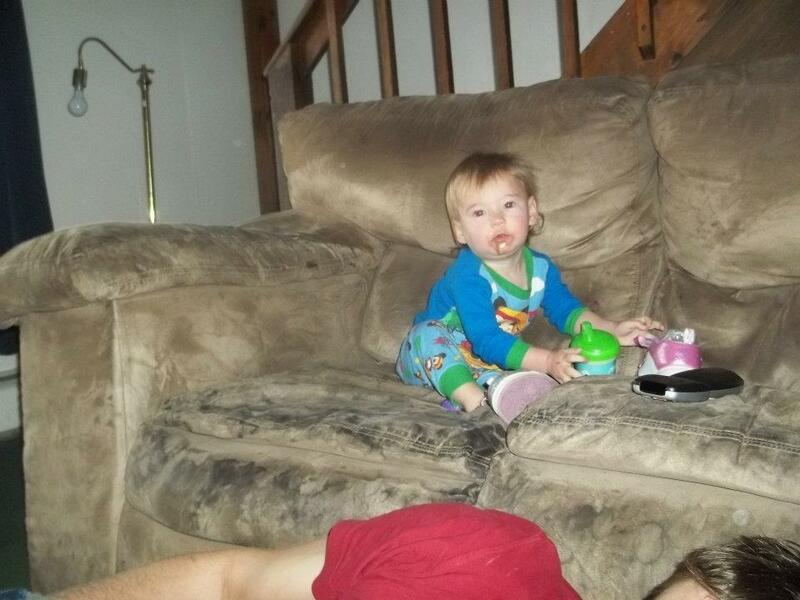 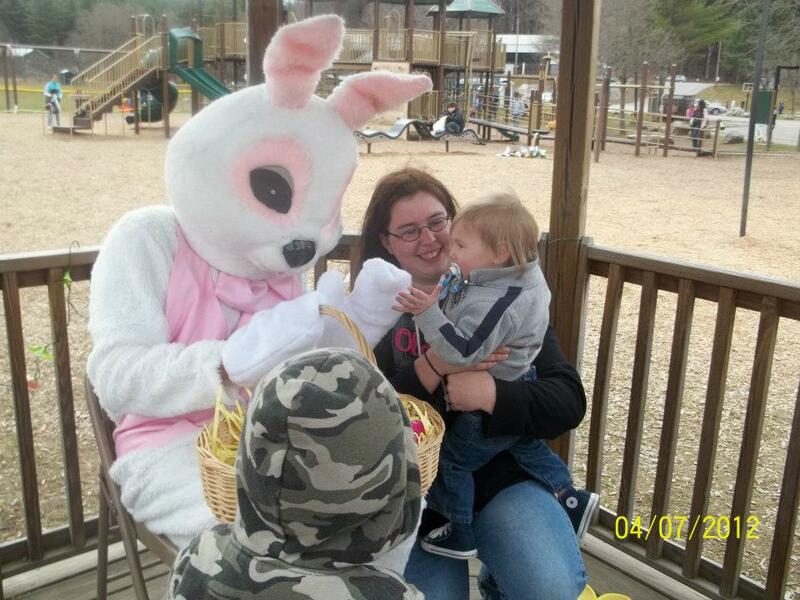 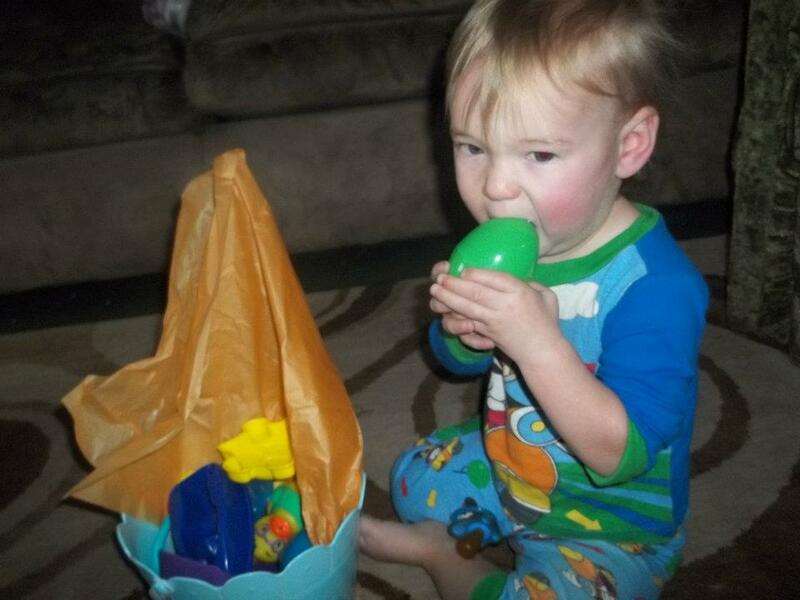 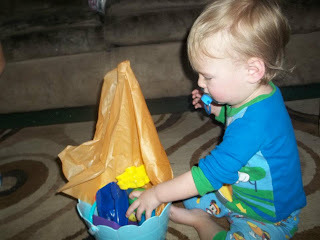 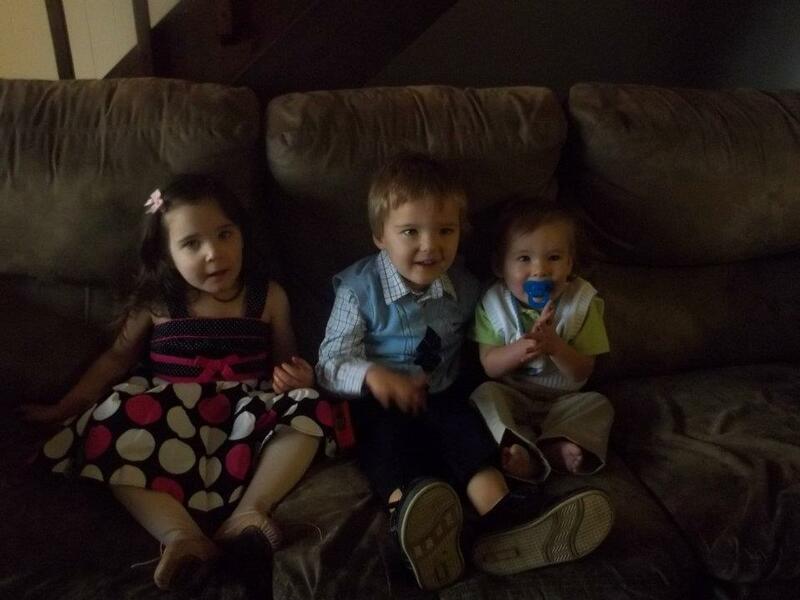 It was an amazing Easter, and a HUGE improvement from last year's holiday, that was spent with puking toddlers. :-) I hope you all had an amazing Easter as well with your loved ones!